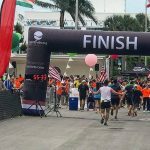 MIAMI, FL – The Divas® Running Series announced the reestablishment of their partnership with Black Girls RUN! for their upcoming fall events. Black Girls RUN! was recently acquired by Jay Ell Alexander, formerly the Public Relations and Communications National Manager of the national running organization. Under her new ownership, came a new vision, where one of her first steps included restoring partnerships with national race series across the country. Both the Divas® Running Series and Black Girls RUN! began within a year of one another, and quickly saw success. In 2013, the two entities partnered together for the first time, with hundreds of BGR! members descending upon Divas® Running Series races in North Myrtle Beach and San Francisco Bay. What developed over the years was synergy empowering women to become more active and enjoying a fun girls’ weekend in some of the best vacation destinations in the country. Pink tutus, boas and tiaras, plus a finisher medal complete with a removable Divas heart charm make for a one-of-a-kind event. Black Girls RUN! now has over 200,000 members across the nation. The Divas® Running Series is looking forward to seeing many of those members at the Divas® Half Marathon in DC’s Wine Country on September 14-15, 2018 as well as the Divas® Half Marathon & 5K in Long Island on October 7, 2018. To become a member of Black Girls RUN!, or find your local BGR! 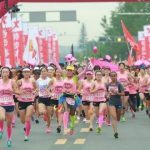 running group, visit their website at https://blackgirlsrun.com/pages/join. To learn more about the Divas® Running Series, and register for one of their upcoming events, visit www.runlikeadiva.com. The Divas® Running Series is a group of female-inspired running events throughout the United States and Canada consisting of a health & fitness boutique, a 5K road race, a half marathon race and finish line experience. Each of the Divas® events consists of additional activities geared toward women including a boa & tiara station, “bubbly” toast at the finish and fun entertainment along the course. Now in its ninth year, the race series received the highly coveted SportsTravel Award for Best Amateur Series or Circuit in 2012, 2013 and 2016. Event locations include Galveston, TX, North Myrtle Beach, SC, San Francisco Bay, CA, Toronto Island, Canada, Calgary, Canada, Peachtree City, GA, DC’s Wine Country, VA, Long Island, NY, San Juan, PR and Temecula, CA. For more information, please visit www.runlikeadiva.com. Black Girls RUN! is a national running group launched in 2009 and has grown to include more than 70 running groups across the nation with more than 200,000 members. The group was created to combat the obesity epidemic among women in the African-American community and to dispel the myth that black women do not run. The groups include beginner and experienced runners and provide a support system to help members reach their fitness goals. Black Girls RUN! provides a community and inspires all women to run. For more information about Black Girls RUN!, visit www.BlackGirlsRUN.com.